For some people, giving a speech in front of a group of people can be terrifying. Especially for young people, who can get bullied for the slightest misstep, speaking in front of the entier school is especially daunting when your entire social reputation is on the line. 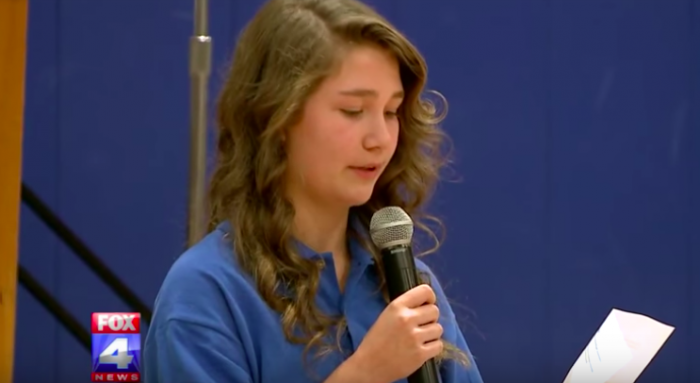 Eighth grader Haley Webb, who was going through some at-home struggles because her father was currently deployed for years, knew this painful experience all too well. 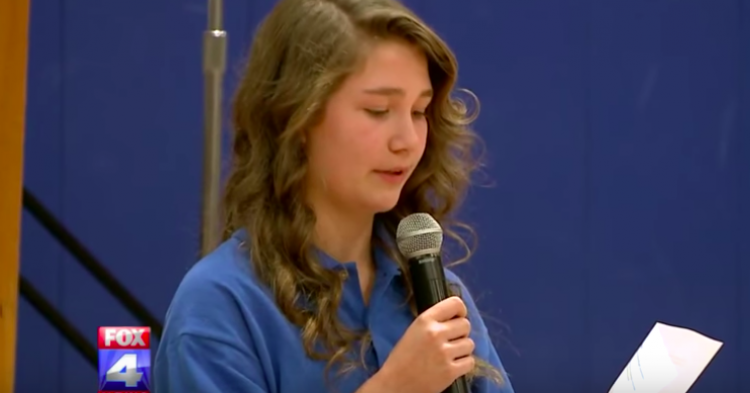 When Haley was asked to introduce a special guest to her classmates at Bingham Middle School in Missouri at a Veteran’s Day performance, she got the shock of a lifetime. 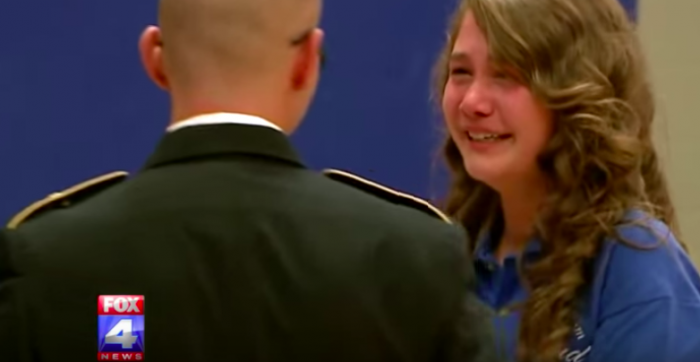 It’s such a heartwarming reunion story, you’ll want to have a tissue nearby. 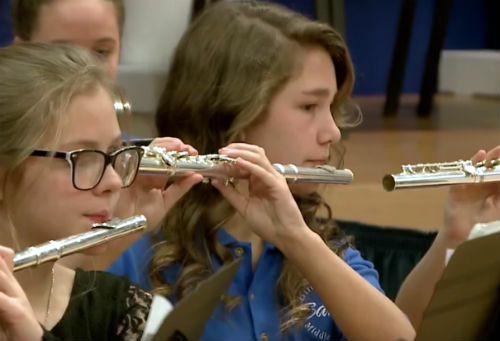 Haley first performed with the school band before she made her way to make the announcement at the podium. Along the way, she was handed a piece of paper, which she starts to read from. She describes the special guest’s life achievements and, near the middle of the speech, she begins to tear up. 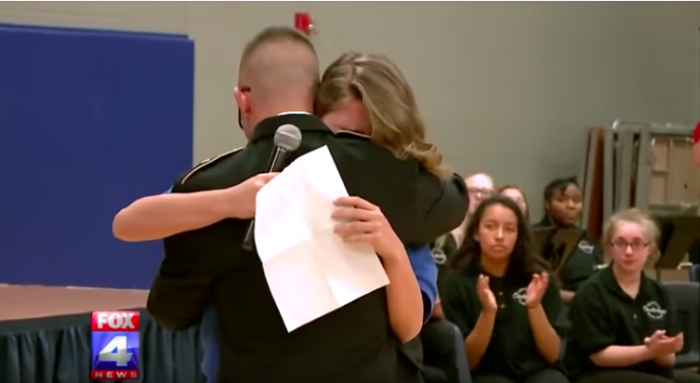 The surprise guest was set up by her dad and grandmother, who had asked the school staff if they could make this reunion happen at the assembly. 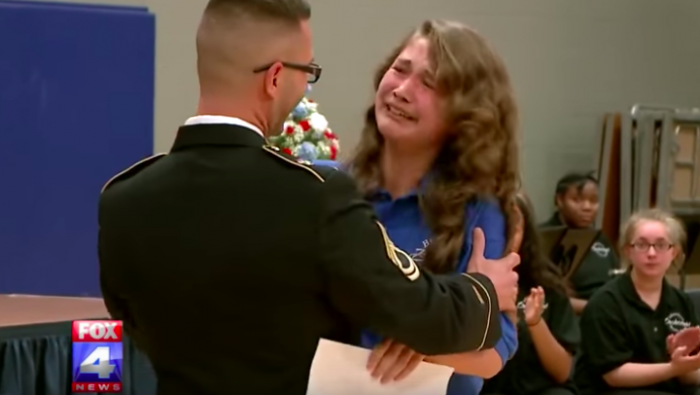 The principals and teachers were happy to help, as Haley was tasked with introducing a mystery guest — her father, U.S. Army Sgt. First Class Jason Webb, who had been deployed in Korea for two years as a combat medic, but returned home. Fox 4 News captured the touching moment, as Haley is seen suddenly realizing that she’s reading about her dad and breaks down crying. 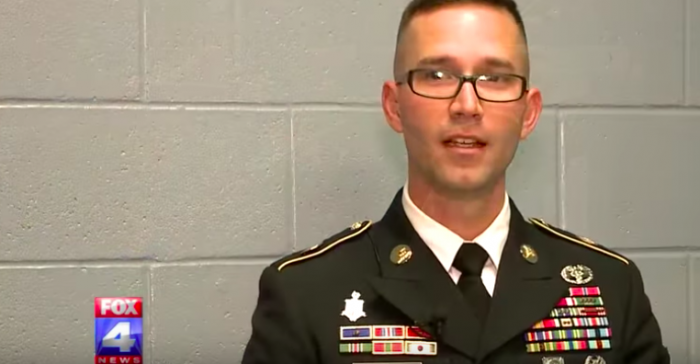 He continued, “A year and a half of not seeing my daughter growing up and… words can’t describe it,” Sgt. Webb shared about the difficulty of being away while her daughter was young. Before their reunion, he said of arranging this surprise, “I think it’s going to be pretty special. They’ve told her that she’s going to get up and introduce a special guest,” where she would read his bio. “As she starts reading my bio, she’ll start putting two and two together and that’s when I’ll walk out,” he adds.